There are several things that separate mankind from our holy God. But in His mercy, generosity and undying desire to be with his people, Yehovah has not only provided a way for us to draw near to him, but He has even provided the things required of us — the things that are required on our part. He provides these things to us in order to remove all the obstacles that keep us apart from Him. We also see in this verse that there is a specific pattern Yehovah designed for each piece of the tabernacle and its furniture. Each piece was designed with a purpose. 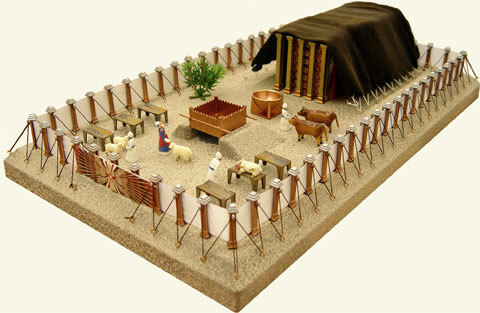 There were seven pieces of furniture in the tabernacle, the first was just inside the fence, then each one progressed closer and closer to where the visible glory of Yehovah dwelt on the seventh piece of furniture – the cover of the Ark of the Covenant, which is called the mercy seat. This is what Yehovah is offering us, and this is the process that we’re all in as we progress spiritually through the pattern of the tabernacle. It’s a matter of how far we’re willing to go in our relationship with our Father. He’s not going to hit us over the head and demand we accept His gifts. We have to take action to pursue them. To the extent that we’re not accepting Yehovah’s full invitation, we’re missing out on those blessings and living separately from Him in those areas. We’ll study each of these in the order that we encounter them inside the tabernacle and how each is Yehovah’s invitation and provision for us to draw closer to Him. This entry was posted on June 15, 2012 by Administrator. It was filed under Blessing, God the Father, God's Character, Tabernacle, Walking with God and was tagged with Altar of Incense, Ark of the Covenant, Brass Laver, Brazen Altar, Discovering Jewish Jesus, Ephesians 1, Exodus 25, Inside the tabernacle, intimacy, Lampstand, Menorah, Mercy Seat, Messianic, Mishkan, moses, Rabbi Schneider, Sanctuary, Spiritual blessings, Spiritual gifts, Tabernacle Pattern furniture, Table of Showbread, The Veil. It is an interesting note that not the smallest element connected to God’s Tent is left without definition. Each person of The House of Israel was given charge over some aspect or piece of its being transported one place to another. If a man with a commission to carry a nail thought to himself “Boy this nail is not going to make a difference I’m tired of carrying it around I’m gonna leave it here” and then did YOU CAN BE SURE that when the camp came to its resting place and the building was to be constructed again — that one nail would be called for and if the man did not have it the structure would not go beyond that point UNTIL that man responsible for its keeping went back and found it and returned. Jesus sees every aspect of His House as important for His Peoples whether it is The Judgment Throne of Mercy or a single peg. The same holds true in The Church and Israel of God today. We are missing some of our greatest experiences inside The Blessing of God because many Christians are ignoring and/or despising the day of small things, and many forget that God does His Greatest Miracles through the small, ignored, defamed and inconsequential overlooked things and persons of His Household. LET US ALL REMAIN PRAYERFUL AND WATCHFUL TO DO GOOD TO ONE ANOTHER FIRST, IN OUR PRAYERS AND DEEDS AND THOUGHTS and then this poor world of lost souls shall see The Tabernacle of David restored in their eyes, having the sight of God The Messiah – JESUS – lifted up and O GOD, how men shall be drawn to Him, hearing the sight of His Faith and Love at work, in operation and excercising The Will of God in the Earth. Aha – very insightful, thank you for sharing that, Shamir. It’s easy to chase the roles the world deems as “important.” I find I need to constantly be soaking in God’s presence in order to be spiritually minded and stay focused on His Spirit’s leading instead of my own logic or ideas. It comes down to obedience and trust.